Your editor recently sorted and packed his worldly goods for a major house move. In the process, he rediscovered a number of “prized possessions”—articles that wouldn’t fit into the themes of recent pages. They’re Good Stuff, so here’s a potpourri for you! Easy Car Routing—BOCR gets rid of paperwork in your operations! 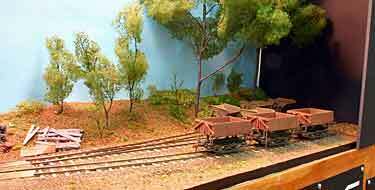 What may be a record number of micro and small model railway layouts were gathered in a single exhibition at the Masterton Train Show, held in August near Wellington, New Zealand. 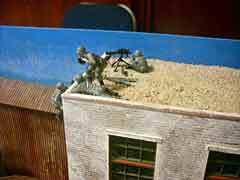 Four talented modelers—Murray McKenzie, Paul Napier, Gavin Sowry and Will Vale—assembled a total of 12 small and micro layouts, many of which had previously appeared in these pages. Five scales were represented: Z, N, HO, On30 and Gn15. 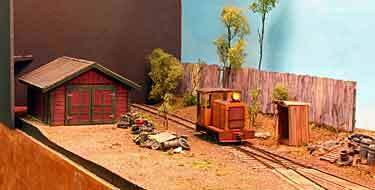 The left photo, taken at the show on Gavin’s Gn15 Haywards Estate Railway, displays Gavin’s diesel switcher conversion (from On30) and Paul’s version with a scratchbuilt cab that he built during the show. The photo below shows about half the lineup as it looked during the setup. 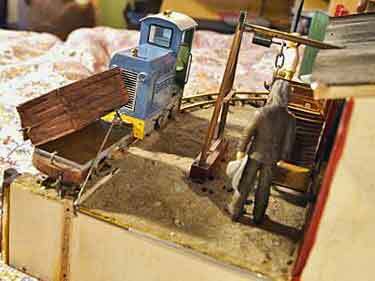 Visitors were impressed by the attraction of many small layouts displayed together! 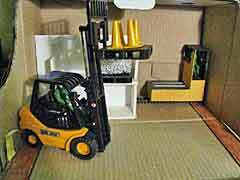 1:24 RC FORKLIFT + Gn15 TRAMWAY = SHOEBOX OPERATIONS! 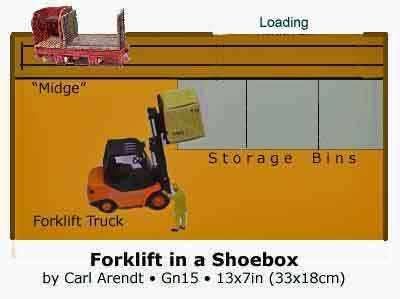 When Carl Arendt first posted the “under develoment” pictures of my Randim Stackum & Wrackem Gn15 warehouse layout on his site, he proposed a “Forklift in a Shoebox” version (right). 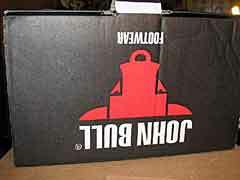 Recently I found an old box that originally housed a set of now well-worn safety boots. At 340x220x130mm (13×8¾x5in), it is close to what Carl proposed. 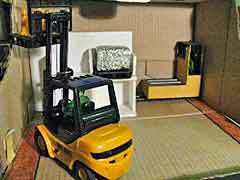 Just to see if it would work, I used the pallet mover and 3-speed radio-controlled forklift from the RS&W, a length of old track, the smaller pallets and cones that came with the 3-speed forklift, and some styrene sheet and foamcore offcuts. A speed build of the as yet un-named micro layout took shape in 4 hours. 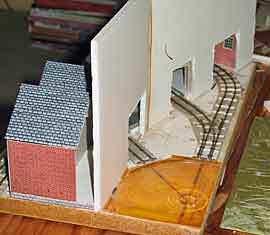 The first three photos (above) show the outside of the bootbox that became a layout housing, as well as the general arrangement of the track and the surreptitious loading opening that will be hidden behind storage shelves (below left). 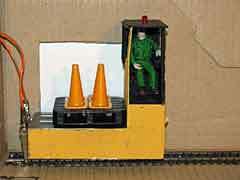 In the center photo above, a pallet of road cones has been placed on the little narrow-gauge (Gn15) pallet-mover loco. 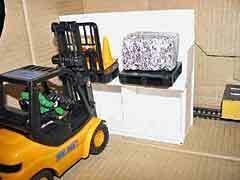 The next five photos show that it is actually possible to perform a “no hands” transfer of the pallet to a designated shelf (at the upper left) using John’s 1:20 RC forklift model. Some pretty fancy driving is involved, starting with picking up the pallet from the motor unit parked at the back right (center photo). Moving to and fro for five moves results in the position shown above right. 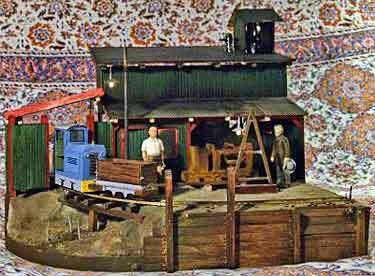 This delightful On30/0e 5-3-3 Inglenook switching layout was built by Karl Schaller (at right), from Eagan, Minnesota, US. It fits on a 4x1ft (120x30cm) shelf and features a black “picture frame” to show it off for exhibitions (an idea sparked by Peek’s Pike on this site). Karl remarked, “The train show was held in the small town of Randolph, Minnesota… I was a tad nervous to display this micro because it’s the first time I’ve ever shown something… and even at my age, this was my first real attempt to complete anything all the way. 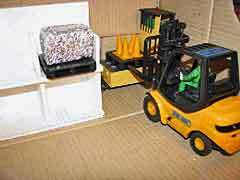 Instead of working with eight different types of cars (or color-coded cars), Karl uses only two kinds of Bachmann cars—V-dump and wooden dump ore cars. He will vary the size of their talus loads (coarse, medium, small, and fine) to differentiate which cars are to be switched in what order. 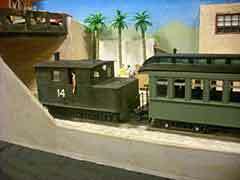 The layout is called Winona Quarry Co., in honor of the Minnesota town where his parents were born and grew up. SOLAR POWER: IS IT READY TO DRIVE A TRAIN? 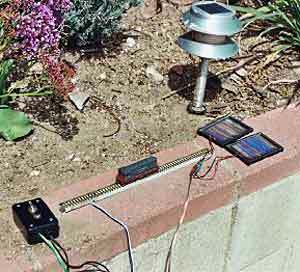 John Bruce, from Los Angeles, California, US, has been doing some experiments with solar-powered model trains. 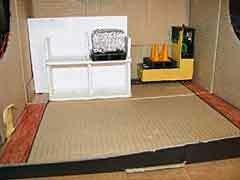 At our request, he prepared the following report: “I’ve often thought about using solar power for a micro layout, since it would be most useful on the kind of good day when you’d want to take a micro outside. I’ve done some experiments with cheap solar panels and tried them with both HO and N equipment. The advantage would be that solar panels would be much less unwieldy than an extension cord and wall-powered control unit. But the results so far haven’t been promising. “As you can see in the photo, I rigged a pair of solar panels (that I ordered from the web) in parallel and hooked them up to track using a box with a DPDT switch and pushbutton. The bottom line is that, as many reviews of such panels point out on the web, the voltage and current ratings for these things are optimistic at best. On a bright sunny day at noon, the panels shown could barely move an Atlas HO RS-3 if it was on a slight downgrade. No luck on the level! PROTOTYPE-BASED DESIGNS — IN O AND HO — FIT THE SAME SPACE! Alexander Kaczmarek, who lives in Berlin, Germany, has designed two layouts in two different scales for the same physical space—each inspired by a prototype German station. 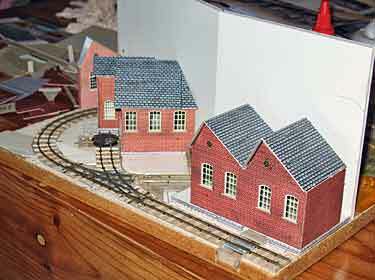 At top right, inspired by this web site, is an H0 micro layout with three independent lines and no turnouts. Further, none of the three lines is connected with any of the others! The baseboard size turned out to be 165x35cm (65x14in). So Alexander immediately designed an O scale line for the same space (right, lower)! Naturally, this layout is space limited, so he elected to emulate a real station that was seriously short of room and called it Grub am Forst. 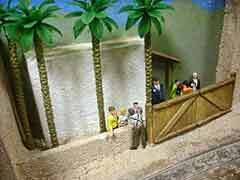 This fictional station is based on several real stations that were truncated by the partitioning of Germany in 1949. “The idea is a in former times unimportant little station which came to high importance by the results of the innergerman border. The line was cut off by the ‘Zonengrenze’ and Grub am Forst advanced to a terminus… but a very short one, because of the border crossing the tracks. ‘BOCR’ FOSTERS COMPLEX OPERATIONS WITH NO PAPERWORK! I really hate lots of operational paperwork. There’s too much mandatory paperwork in our daily lives for me to voluntarily include reams of car cards and waybills and switchlists and Form 31 orders in my hobby. Shaking up the tokens on an Inglenook is about as involved as I care to get. 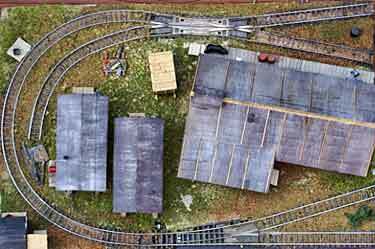 But just shoving any old car into any old siding isn’t very satisfying, either—and since I like to have several ‘destinations’ on my layouts, some form of car routing is necessary to avoid the old reefer-at-the-coal-mine gaffe. So I use the BOCR system to determine what car goes where. BOCR stands for ‘Blindingly Obvious Car Routing’, and it proved its worth on my Mill Street layout (see Scrapbook #70). BOCR is predicated on the assumption that each industry and car spot on your layout accommodates a different type of car. This is easy to do when designing the small layouts we like to build. So one industry accepts tank cars, another takes boxcars, and so on. In one fell swoop the need for extensive paperwork is eliminated. When you stage or fiddle a cut of cars to be delivered, each car’s destination is automatically determined by its car type. 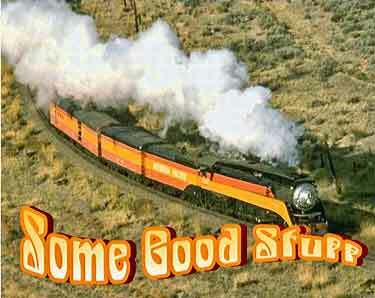 Got a refrigerator car on the inbound track? Well, if the ice house is the only place on your layout which could plausibly receive a reefer, it becomes pretty Blindingly Obvious where that particular car belongs. Same thing with the tank car behind it (the retail oil dealer) and the lumber flat (the furniture factory). Okay, what about the ubiquitous boxcar? Just about any industry could justifiably receive a house car. This is simple, too—a glance at the reporting marks is all that’s necessary. On my Mill Street micro, there was an auto parts distributor. Any time a Michigan Central boxcar showed up, I thought to myself, “well, they make a lot of cars in Michigan, so this car obviously belongs at Dependable Parts.” Similarly, a Central of Georgia car was filled with baled cotton for the knitting mill, and that orange Bessemer & Lake Erie 40-footer held coils of sheet steel for the fabricating works. 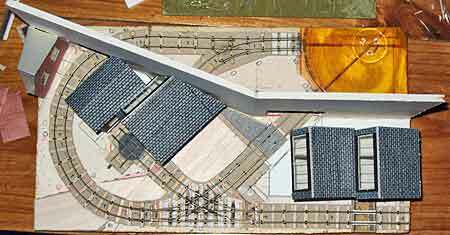 If even this is too much hassle, have your layout depict a railcar rebuilding works like Moose’s Cabooses from last year’s trackplan contest. Such a business is a useful ‘universal industry’, like an interchange track, a team track or a wharf. Since a rebuilders’ yard can accept any type of car, no matter what cars show up in inbound staging, the engineer and conductor can spot ’em all in the same siding(s). Outbound cars are even easier. Once a car has been spotted at an industry, its next move is off the layout to someplace in the vast North American rail network. And there’s usually only one interchange on a micro layout, so your route is Blindingly Obvious. 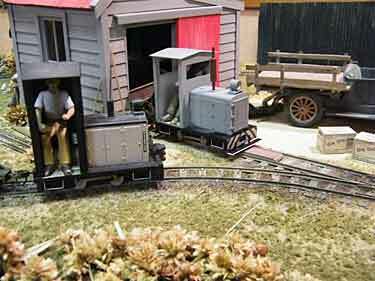 Bob took these photos at the 2009 Telford Narrow Gauge Exhibition. 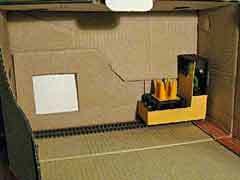 The layout is basically an Inglenook style switcher, with many intriguing details like those in the pictures, including a Sentinel geared steam loco #14 acting as station switcher, some commotion outside the cantina, and soldiers guarding the post and express office. Christian Amman, from Nuremberg, Germany, was inspired by the Squarefoot Estate Railway to build this very similar Gn15 layout in a 43x36cm (17x14in) space. He calls it Kleinzeche Eimerweise (“Small-Mine Bucket-System”). 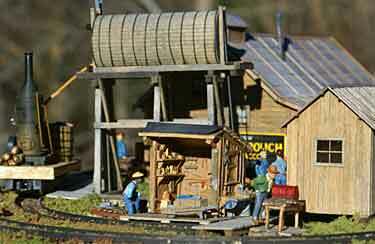 Featured operation, like the Squarefoot, is to load an open wagon with coal (or candies), move it to the front track via the hidden sector plate, and dump the load off the layout (for candy, it’s dumped into the eagerly waiting hands of the audience!). These photos show the operation, including Christian’s “low-tech but big fun” tipping method, which involves a manual lever that raises the wagon’s side from quite a distance away! The system has two speeds, 7.2V (slow) and 6V (slower). A single switch controls both the speed and the direction. There’s a web site with much more information about the little line. Christian has also prepared and placed on YouTube a delightful video of the layout in action (below). Click on the large arrowhead to see the show… and be sure to turn up the gain on your sound system—the sound track will surprise and entertain you! Perko Paper Products first appeared on this website in 2004 as a design by Geoff Perkins, from Brisbane, Australia. The HOn30/HO-9 layout fit on a sheet of A4 (letter-sized) paper. Now, five years later, Geoff has found some time to actually build the line! Here’s a set of progress photos. He has laid the track, including some special work that shows up well in the aerial view (above left). 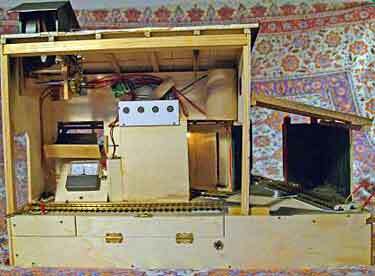 Backstage, a rotating sector table (upper right) has been made from a CD disk and jewel case (see article elsewhere on this site). And Geoff is adding structures, fittingly kitbashed from Metcalfe Models low-relief factory card kits. We’ll keep you pasted on progess at Perko! 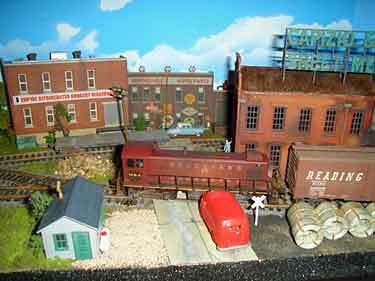 Larry Knapp, from Charlotte, North Carolina, US, built this delightful little shoebox line in HOn30 to enter a “Shoebox Layout Challenge” at the Railroad-Line Forums’ Micro & Mini Layout section. 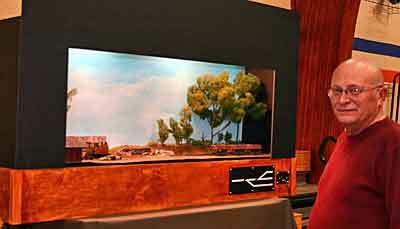 The layout measures 13½x8¾in by 4in high, using N scale trackage (9mm gauge) with HO scale rolling stock and scenery. The loco is a scratchbuilt vertical-boilered Climax that scrapes very gingerly around the tight curves. Larry’s previous efforts featured in these pages are found in Scrapbooks 68a and 83a.